Remy Hair Extensions Q&A: What are they? "What are remy hair extensions?" Remy hair extensions are hair extensions made with remy hair; yup, not super helpful but read on and we'll get to the heart of the matter, or rather the cuticle of the matter. In order to explain things fully, we should say that originally the term remy (which was originally (and still is) remis) is from the French word remettre meaning to put back (it's the past participle of the French verb remettre and means "re-put" or "put back"). It was used in the olden days in relation to the making of wigs with human hair and "to put back" meant to put back the hair in the same direction as it was when it was cut from the donor's head - all the cuticles facing the same direction; downwards. The term remy is now used to describe the structure and direction of human hair in any hairpiece, hair extension or wig product. Remy is about cuticles and the direction in which they point. 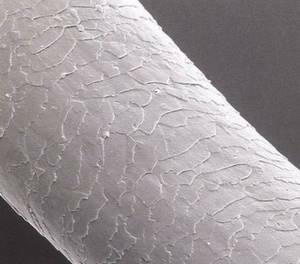 A bit of quick biology reveals that all human hair has cuticles that point away from the roots. Remy hair has all cuticles intact, unaltered and running in the same direction. So back to the question; what are remis hair extensions? If all of the strands of the human hair extensions that you buy (whether a weft, pre-glued hair extension or clip on hair extension) still have their cuticle layer and if all hair strands point in the same direction then these are called remy hair extensions. 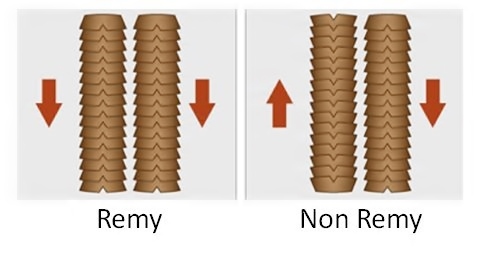 Remy hair has less of tendency to tangle than non-remy hair extensions. This isn't to say that remy hair cannot tangle - it can and it does. All natural growth hair would qualify as remy hair (as all the cuticles face the same direction). Never-the-less, every hair single type of natural growth hair texture experiences tangling - including naturally straight and wavy textures (why do you think the Tangle Teezer was invented?). Remy hair is less prone to tangling but it isn't tangle free. "What is the hair used in non-remy human hair extensions?" Hair that doesn't have its cuticle layer (in these instances, the direction in which the hair strands point is irrelevant as there aren't any cuticles). The majority of human hair on the market (wigs, hair extensions including hair weave, micro ring hair extensions, clip on hair extensions, lace front wigs, toupees and lace frontals) are made with non-remy hair (typically mixed hair which contains both remy and non-remy hair strands). Part of the human hair marked (on a global scale) includes the sale of unprocessed non-remy hair. When you consider the above it's clear that the non-remy-tangling argument loses a bit of its edge; this isn't to say there aren't "bad batches" of hair extensions and wigs out there that will tangle unceasingly or become matted, but that it's not the case for the vast majority of non-remy hair; because if it were, then it could not be sold because it would not be bought... ever... at all. Righto, that's a wrap on remy hair extensions. There are more answers to more questions about hair extensions which you can peruse in the Your Hair Extension Questions, Answered section or by using the navigation menu. If you'd like to keep up to date with new articles and guides about hair extensions, wigs and hairpieces, then join our blog which is super simple to do and doesn't require any personal info.